Makarska Riviera is a coastal area in central Dalmatia situated between great bay Vrulja in the northwest and cape Višnjica (Ploce) to the southeast. This area, about 60 km long and about 3 km wide, is bounded by the sea on one side, and the by hinterland mountain called Biokovo on the other. The backbone of this belt forms the city of Makarska and a number of settlements. Northwest of Makarska are : Brela, Baska Voda, Promajna, Bratus and Krvavica. Southeast are : Tucepi, Podgora, Drasnice, Igrane, Zivogosce, Blato, Drvenik, Zaostrog, Gradac, Brist and Podaca. The main industry on the Makarska Riviera is tourism which became very important between the two World wars. Makarska Riviera is a particular ecologically preserved area of natural beauty, rich culture and tradition. If you want to feel all contradiction that Dalmatia can offer and it's most brilliant qualities, do not hesitate, Makarska Riviera is ready to offer you more than that. You can search but nowhere you will find this kind of beauty, sea, coast and mountains, all in one. Here the sea is the clearest in the whole Adriatic, which means in the world. The coastline is decorated with a beautiful neckless of gold beaches, edged with green pines, romantic and secluded coves where the towns and villages of Riviera are hidden. You can enjoy yourself in one of dozen luxury hotels or in an intimate and hospitable atmosphere of hundreds private guest houses and apartments. Tastes and smells of the Makarska Riviera are offered in the renewned restaurants and taverns. Premises for entertainment, bars and disco clubs guarantee the challenges of the night and an unforgettable friendship. Makarska Riviera is an area of multiple adventures that are just waiting to be discovered. By its geographical location and cultural and historical significance Makarska (14.000 inhabitants) since it's beginning, is the center of the Makarska Riviera. Situated at the foot of mount Biokovo in naturally protected port, sealed from the southeast by peninsula Osejava, and from the northwest by peninsula St. Peter. Makarska has an older mediterranean type core and the newer part with hotels, restaurants, shops etc. Ancient evidences found on peninsula St. Peter, the central square and in harbor witness that the present-day city was built on the site of the ancient roman, and maybe even a prehistoric settlement. The acts of Salonian parliament since 4th May 533. first was mentioned Mucurum as a place where a diocese was founded. The name Makarska was first mentioned in 1502.in a document written by Musin Muhammad. The most important economic activities in Makarska are olive industry, fishing, food processing, trade, and of course, tourism. Tourism has a long tradition because in1914. the first hotel was built, and in 1922. society “Beautify the city” was founded. Athletes and recreation enthusiasts may use numerous sports facilities on land and sea. Close to famous beach of Makarska, modern tennis center is located where important tennis tournaments are held. Makarska is also known for recreational and health tourism thanks to the resorts Biokovka and Marea, which offer a variety of therapeutic services. A stroll along the port and public beaches is very pleasant, but those more willing to stronger efforts should explore one of the many hiking trails to the peaks of mt. Biokovo. You will find yourself surrounded by pleasant freshness, peace and magnificent views. The mountain is interesting for it's gardens, valleys, caves and meadows, endemic plants, and also mountain goats and mouflons. Cultural and entertainment programs are an integral part of life in Makarska, especially during the tourist season. In July and August traditional Makarska cultural summer is held, with a rich drama and concert program, performances of Dalmatian harmony-singing groups, art exhibitions, recitals and folk music performances. The events are the Fishermen's night and the Kalalarga night (night of the city). A tourist who will make a decision to stay in Makarska will have a choice of different forms of tourism. One can choose between accommodation in hotels (2,300 beds), camping (500 sites) or private accommodation (10,000 beds). The city has a multitude of restaurants and other catering establishments with rich selection of traditional dishes and drinks. Brela (1,500 inhabitants) is the first resort on the Makarska Riviera, when you are arriving from Split, located about 15 km from Makarska. It consists of an older (Gornja Brela) and the new part (Lower Brela). The present town was developed by migration of residents from small hamlets underneath mt. Biokovo. The parish church from XIX. century was built on the site of an earlier baroque church, the cemetery is a mediaeval necropolis with eight tombstones adorned with reliefs (shields and swords). The church houses several tombstones from the XVIII. century. 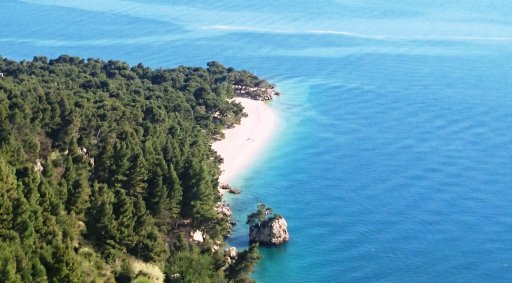 Thanks to the long and dense pine forests, beautiful beaches, clear water, Brela is known for decades as one of the most attractive tourist resorts in Dalmatia. Brela offers the accommodation of the highest quality, so the hotels in Brela are often called the best in Croatia. Apart from the sea and sun, Brela offers various opportunities for sports and recreation. Beach "Zlatni Rat" every year receives "Blue flag", award given to beaches that meet only the highest standards in terms of quality of the sea and other resources near the beach. Tucepi (1800 inhabitants) lies 4 kilometers southeast of Makarska. It was founded in ancient times. At the cemetery were discovered the remains of early Christian church from 5th to 6th century and several medieval tombstones. The present name was first mentioned in 1434. Church of St. George was built in the transitional romanesque-gothic style in the late 13th century. In the 18th century Makarska family Ivanisevic and Lucic-Pavlovic built the baroque villa by the sea. Until the earthquake in 1962. The majority of the population lived in villages at the foot of mt.Biokovo. Situated on the slopes of mountain, Tucepi is a long chosen tourist destination. Quality accommodation (hotels and apartments), mile long beach, homemade food, lounges, sports and recreation facilities attract lot of regular clients and make it one of the most exklusive resorts in the Adriatic Sea. Drašnice (330 inhabitants) is a small touristic and fishing village 12 kilometers southeast of Makarska. Population is also engaged in agriculture (vineyards, olives, figs, ...). The village was first mentioned in documents in 1523. at the same time as the church St. Jure, after destroyed in the earthquake. Today, there is a rebuilted church od St. Jure and also a new church Immaculate Conception of the Blessed Virgin Mary with baroque elements of an older church. Above the village is a gothic church St.Stephen, housing a roman inscription from the 2nd century. The coastal part is covered with pine forests and olive groves, and the coast is dotted with beautiful sandy beaches. Steep streets, old Dalmatian houses and natural beauty that abound in diversity make Drasnice a charming place for your vacation. Town Drvenik and port (500 inhabitants) is located 25 kilometers southeast of Makarska and situated between two bays - Upper and Lower Vala. Population is dealing with agriculture, fishing and tourism. Drvenik was first mentioned in the 13th century. The foundations of the gothic church St. George, later baroque, were built from a medieval tombstone. One of the most important monument-fort, generally in the Makarska Riviera, is a fortress Drvenik built in the 17th century. Crystal clear water and clean environment, beautiful cove with the sources of drinking water as well as friendly hosts and healthy food with a variety of possibilities of active rest and recreation, make Drvenik a perfect destination away from urban centers. Zaostrog (300 inhabitants) is a town and port, located 33 km from Makarska and 16 km from Ploce. It consists of an older part below the Mt. 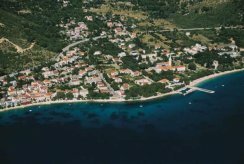 Biokovo and the new settlements on the coast. Chief occupation is farming, fishing and tourism. The name Zaostrog was first mentioned in 1494. The most important monument is the Franciscan monastery which was built in the 16th and was completed in 17th century. Today, in the interior of the monastery are kept many historical and artistic items. Crystal clear sea, the whiteness of sandy beaches, green pine forests and olive groves, quality accommodations, domestic food and atmosphere of the old town under the hill are reasons why Zaostrog is attractive to tourists.